A small percentage of people do not benefit from Nasodren due to unknown reason (idiopathic cause). In other words, a product or a drug that works effectively in a patient may produce no effect in other patient. Others cause of lack of efficacy is the existence of huge polyps. Huge polyps may block the opening of the sinuses and the nasal passage impeding mucus drainage. Other anatomical malformations can produce similar results. It is advisable to visit the ENT specialist to assess the existence of large nasal polyps and treat them properly. The ENT specialist must assess these conditions and treat them properly. Another cause of lack of efficacy of Nasodren is the concomitant (simultaneous) use of a decongestant. The mechanism of action of the decongestants (vasoconstriction) impedes the action of Nasodren. 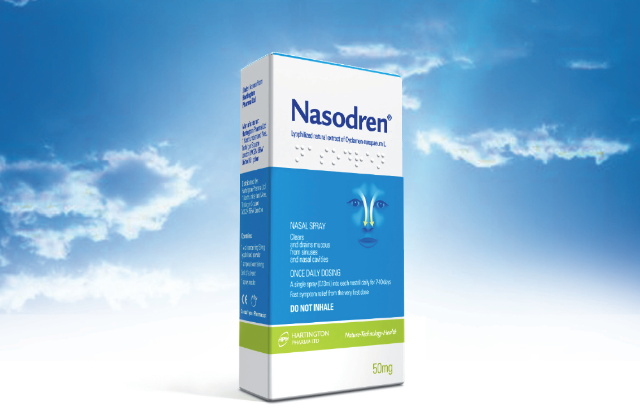 It is not necessary to use a decongestant when using Nasodren but in case the patient wants to use both, a gap of at least 2 hours must be left between the applications of both products. According to our data, about 85% of rhinosinusitis patients significantly improve when using Nasodren. Nasodren is a very safe product since its active ingredient, saponins, is not absorbed and consequently they do not reach bloodstream and don’t produce systemic side effects, i.e. do not affect the liver, the kidneys or other organs. I do believe that Nasodren will improve your symptoms and therefore your quality of life as millions of rhinosinusitis sufferers worldwide have already benefit from its use.